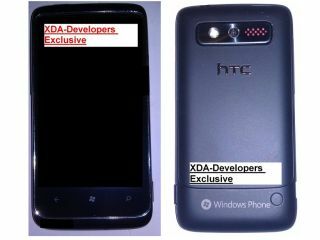 Photos of an upcoming Windows Phone 7 handset from HTC have surfaced online, with the dubious codename of HTC Mazaa. The images come devoid of many juicy spec rumours but we can examine both the back and the front of the handset and glean a few tidbits as we go. It's a fairly safe bet to say that the screen will be a capacitive touchscreen affair, possibly a 3.7-incher. The three capacitive touch buttons at the base of the screen are the normal Windows Phone tappers – back, home and search. The back of the phone reveals a centre-mounted camera, LED flash and an external speaker, but it's hard to tell if there's a front-facing camera on there for video calling too. The cunning leaker also suggested that the HTC Mazaa may come with DDR2 – aka double data rate synchronous dynamic RAM interface (try saying that with a mouthful of marshmallows) which spells super-duper speedy performance.